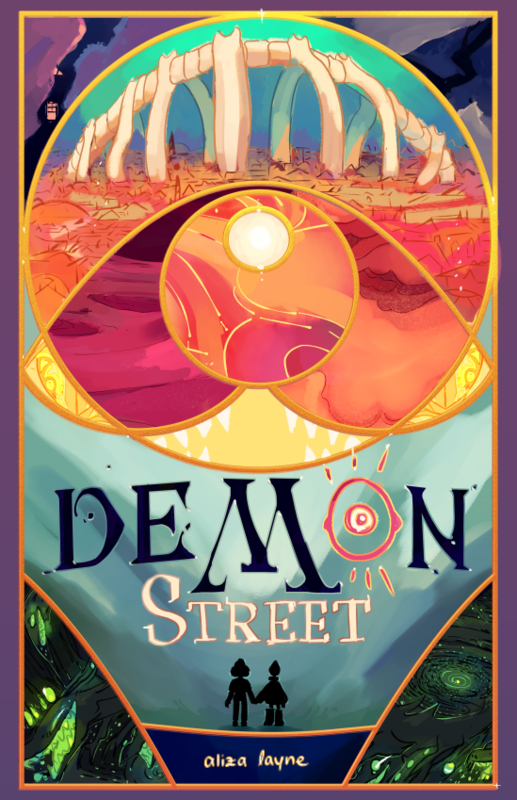 Demon Street is a comic about exploring. Three months ago, a few human neighborhoods from all over earth disappeared, leaving doorways to another world in their place. Raina walks through one in search of her parents, her house, and all her neighbors, now missing. Kate and Celine escaped the stolen street and the human world, creating a new life for themselves in a city of monsters and magic. Now Sep, 12 years old and a goofy, self-taught explorer, stumbles into this intrigue months later than everyone else. He gets swept into Raina’s quest, developing disquieting magic ties in the process. Demon Street is a fantasy adventure story about a world where human names can be traded or stolen away. Kids fly on enormous winged ants, explore swamps and forests and a huge city, befriend monsters, fight horrible lizard swarms, and get crushes on each other. It's about quests and monsters and magic and choices. demon street is intended for all ages. It contains some fantasy violence during action sequences, brief scenes including blood, and frightening situations. Some creatures could be considered light body horror, or may be a trigger for texture sensitivity/texture phobia.